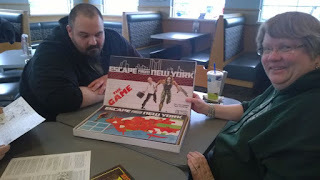 Wendy found a copy of the old Escape from New York (1981) boardgame published by TSR some 35 years ago. Our friend Tom was a playtester on this back in the day and worked a bit on the game. 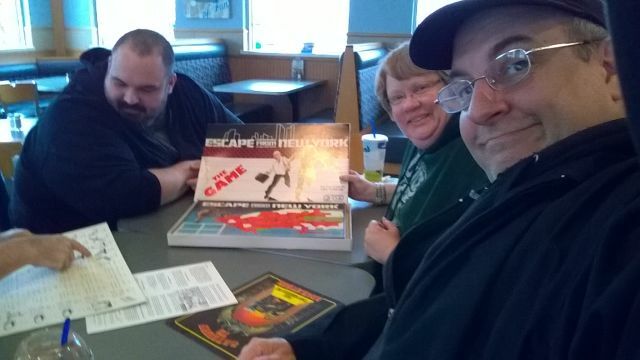 The components of this one are not up to the quality that TSR games would see in subsequent years. 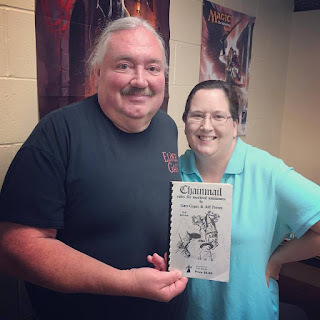 They were really just starting to come into their own beyond the 1E AD&D core books and magazines, spreading their wings and becoming a real competitor in the game industry beyond just Dungeons & Dragons. "Snake, I thought you were dead!" This modest board game, based on the John Carpenter movie, casts each player as Snake Plissken, an ex-con sent on a rescue mission into a giant prison once known as New York City. Players begin with weapons and equipment cards used to help fight enemies and find clues. Cards can be lost in fights or gained at landmark spaces. Turn in matching clue cards at the corresponding location to rescue the president or his important tape. To escape, you still need to find a glider or a map to the mine fields. 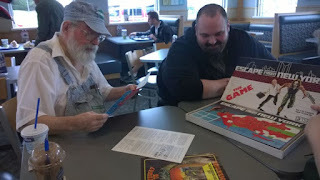 Fans of the movie will enjoy the chance to encounter Slag, Brain, Cabbie, Maggie, the Duke, and Romero with the opportunity to gain them as allies during the game. Players win by obtaining the Tape first and foremost, failing that - the President himself. The game is very faithful to the movie and players will find that they can mirror many scenes of the movie in the game. We didn't play the game. It's not highly rated and since it was unpunched, it would have been a shame to make it less collectible than it might be. I recall playing this years ago and it is more like early parlor games than modern boardgames. This is best kept as a curiosity and collector's item, I think. It certainly is an interesting piece of history.